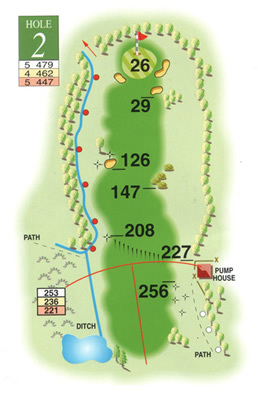 This is a relatively generous par 5 offering a good chance of an early birdie. The tee shot is crucial and should ideally be placed on the left avoiding the right side fairway bunker and rough which can be heavy and result in a poor lie. This can put pressure on the second shot where reaching the green is possible but care should be taken as there is little room at the rear of the putting surface. Behind the green there are numerous trees and brambles and an overly long shot into these can make dropping legally no nearer the hole difficult if not impossible. The green can be especially tricky when the hole is cut on one of the many slopes but a par 5 should be achievable by most reasonable golfers.